“Everyone who belongs to the truth listens to my voice” Jesus tells Pilate to which Pilate responds: “What is truth?” Indeed that question seems particularly relevant for our world today. What does it mean to belong to the truth? This week an extensive survey conducted by Cambridge University reported that sixty per cent of British people believe at least one conspiracy theory about how the country is run or doubt the truth of information they have been given, part of a pattern of deep distrust of authority that has become widespread across Europe and the US. Almost half (47%) of those who voted for Brexit believed the government had deliberately concealed the truth about how many immigrants live in the UK, versus 14% of remain voters and a striking 31% of leave voters believed that Muslim immigration was part of a wider plot to make Muslims the majority in Britain, a conspiracy theory that originated in French far-right circles the survey reports. The disparities between those who voted for Donald Trump and Hillary Clinton in the US was even more stark, where 47% of Trump voters believed that man-made global warming was a hoax. love and serve the Lord, rejoicing in the power of the Holy Spirit. It seems a good place to start. Hold fast to that which is good. Perhaps it is now we need to stand with Christ. Christ the king. What can we learn from the way this true king faces false accusation and the manipulation of truth. In the scene we have read as Jesus stands before Pilate everything is at stake. This is the moment when faced with the prospect of torture and death who among us would not be tempted to save ourselves at the expense of the truth. Who among us would have the courage not to abandon truth to the lynch-mob? But for Christ truth is sacrosanct. You see it is not simply the words he speaks it all that he is, and he cannot be contrary to himself. How often even in small things we find that once we have embarked upon the path of untruth, deceit multiplies, not only have we lied but we are forced to tell more lies to cover the initial lie. This is a slippery slope for the more we hide and lie to conceal the deception the greater the deception grows until we ourselves become so tangled up in the deception that we no longer recognise what the truth is. In other words we begin to believe the lie because we have become slaves to it- tangled up in our own intrigues. What happens when not only the individual lies but the society or the nation we are living in gets trapped in a lie. The consequences as we saw in Nazi Germany or Pol Pot’s Cambodia are terrifying and it does not necessarily begin with the desire to do evil look at Aung San Suu Kyi in Myanmar and what has happened to the Rohingya people. Look at the denial of the effects of climate change and what is happening to the world. Truth has power, but so too does the denial of truth. The abandoning of truth has its own power and momentum and generates a tangled web of deception and often destruction. The abandoning of the truth, or the sacrificing of truth has another name. It is called evil. Contrast this with the accused Jesus. I have printed a picture from the National Gallery for you. 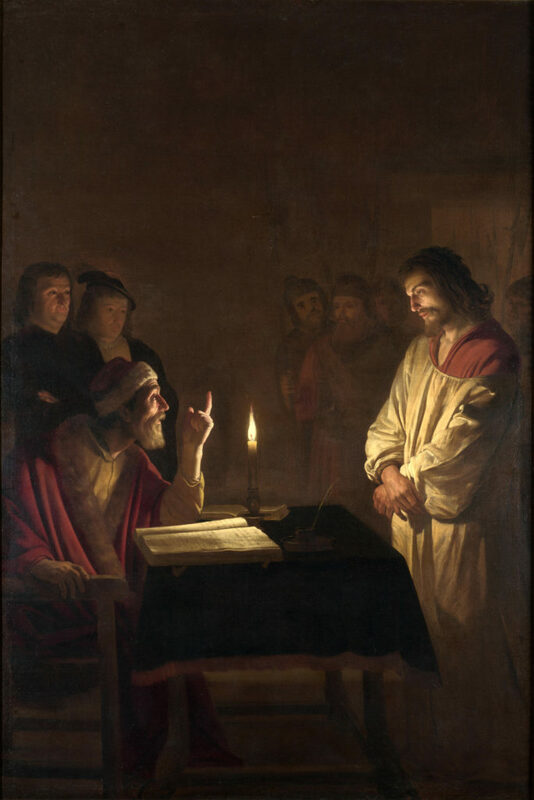 A picture by Gerrit Von Honthorst of Christ before the High Priest. It is one of the paintings in the National Gallery that you can return to time and time again especially when you feel despairing or overwhelmed. Have a look at it now. It is as though this painting silently offers salvation- but how? Christ’s hands are tied. In front of him the accuser finger points in volatile accusation. Yet the first thing one notices is the stillness of the Christ figure. It is as though his very body is refusing to respond to the venom of the attack. Rather his posture seems almost languid. The white robe, which follows the relaxed pose of his body is bathed in the light of the candle, it is slipping from his shoulder, but he does not move to adjust it. The tension and piercing stare of his inquisitor is juxtaposed with an openness and a translucence in the figure of Christ There is no defensiveness in Christ rather it is as though were being invited into the very heart of Christ. Look at Christ’s eyes he returns his accusers stare with a beholding. “Why askest thou me?” (John 18. 19) Why not question yourself? The gentle Christ is the most powerful, tallest presence in the picture as though he is soaking up all the falsehood and defeating the lies. Holding fast to all that is good. Even here giving back to no one evil for evil. In contrast the High Priest is trapped by the chair and table and the law books in front of him. Though Jesus stands accused it is as though the roles are reversed and his accuser seems the frightened, startled one, who is in fact the one on trial for though he claims the books of the law as his own does not belong to the Truth. In the High Priest we see the skull beneath the flesh and are reminded of our mortality but in Christ we see Word made flesh and are reminded of immortality. But what about Jesus. There is no wagging finger there. In fact his hands are tied. No accusation rather an invitation to come in. It’s as though he is saying the real kingdom, the real authority, the answer to all your fears is within me. The kingdom of heaven is here within my very heart and though you will put my body to death in the most painful way imaginable you will never ever be able to defeat the love of my heart. All of us at some stages in our lives will come up against that accusation. We will come up against those forces that seem to deny all that we are and all that is true. The question is not will we face those moments of trial but will we be poisoned by them. Will we when facing injustice become the unjust, will we return the hated, return the exploitation, return the violence, return the lie or become infected by it so that we no longer know the truth. Or can we discover the Christ within us. Can we transform the wagging finger through the sacred heart of Christ? Will we discover where we stand and that we stand with Christ? His open translucent compassion for the world. We are not seeing the death of Truth, in him we are seeing salvation. How do we belong to the truth? Look to Christ. This is the one, as Revelation tells us: “who loves us and freed us from our sins by his blood, and made us to be a kingdom.” To be a kingdom in which Christ is king not us. Our united kingdom across the world, gave us our humanity and our divinity. This kingdom of God within us.